JTX Cyclo-5R Customisable programmes - Lifetime frame warranty - Bluetooth enabled - Commercial gym specifications - 8.5kg flywheel High end VIEW PRICE HERE! Kettler LCD display - Polar compatible receiver - 16 resistance levels - 12 programmes High end VIEW PRICE HERE! Nordic Track R65 32 workout apps - Extra wide pedals - iFit Live compatibility - 9kg flywheel Mid range VIEW PRICE HERE! V-fit BST-RC 5kg flywheel - Simple computer monitor - 8 levels of resistance - Classic look Affordable VIEW PRICE HERE! Technovita YF93 Lateral support handles - Good back support - Easy of storage - Functional design - 8kg equivalent flywheel Affordable VIEW PRICE HERE! We begin our list with a super slick, gym standard, bike. The JTX Cyclo-5R features a step-through design (VIEW PRICE HERE! ), well considered full ergonomic back support and an 8.5kg flywheel offering professional specifications for domestic use. The high spec on board computer, with Bluetooth, combines all the stats you need with iConsole app connectivity to ensure every workout is tailormade to suit your needs. The stable seating position and potential for intense resistance recommends this as an injury comeback machine or an athlete’s choice. However, there are a range of abilities accommodated making it a good all rounder too. A low entry height and frame make the Kettler Premium recumbent exercise bike a fine safeguarding option for older or injured users who may have impaired mobility and balance. A dozen workout programmes and 16 stages of electronic resistance will see you through anything from gentle stamina building to intense bursts of cardiovascular sprint. The seated posture is, of course, the thing which sets recumbent bikes apart. And the seat on the Kettler Premium is comfortable, supportive and able to be adjusted down a sliding slope. The back is fixed. A long term investment in your heart health, muscle strength and mobility will prove one of the best investments you ever make. The Kettler Premium is a solid investment and a solid machine which brings together the best advantages of technology with a disability friendly design, conscious of the potential physical hurdles older or injured users might face. A chunky build and high back support ensure that taller users are not excluded from enjoying this excellent bike. For a fairly priced mid range model the Nordic Track R65 certainly doesn’t lack appealing features. This is a smashing bike for an intermediate user or for anyone with long term fitness goals in mind. 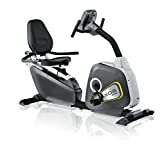 Creatively stocked with multiple workout apps (and iFit Live compatibility for the option to add over 1,000 more) you need never run out of ways to keep the cardiovascular challenge exciting on this smart looking recumbent exercise bike. A low bar and careful seat positioning make the Nordic Track R65 another good choice for users who have compromised or limited mobility. However, this is also a nice option as a machine for ongoing use through injury and beyond. Even the ultra fit will find sufficient lures to tempt them into buying. And they would be choosing well. That 9kg of inertia allows plenty of room for personal growth and pretty much guarantees enviable quads, glutes and abs in anyone prepared to put in the hard work! Everyone loves a song and dance routine at this time of year. But all singing, all dancing isn’t everyone’s cup of tea when it comes to home exercise equipment. The reassuring sturdiness and reliability of a more pedestrian machine can bring home users equal benefit simply by cutting out the faff. The V-fit BST-RC is one such machine. Demanding no advanced computing skills to persuade stats from its monitor and little fiddling to achieve correct posture or find your footing. Reach and height are adjustable with a few straightforward actions while those self-presenting pedals are a pleasingly high end touch. If a gentler ride on a recumbent bike seems more your speed but you have put off making the decision to buy because space is at a premium in your home you should definitely read on. The Technovita YF93 by BH combines some of the advantages of a recumbent bicycle with the compact convenience of a classic folding exercise bike. Users gain no less benefit from the relaxed posture enabled by that seat position and low impact or cycling movement but they lose the hefty footprint of a static machine. Unlike the majority of models we’ve explored today, the Technovita YF93 is not an ideal choice for less active senior users or users with impaired mobility. Lacking the reassuring stability of a classic recumbent bike, requiring a higher leg swing to climb aboard and the dexterity to manually adjust resistance and featuring a saddle and backrest combo rather than a seat, this is more a relaxed take on a typical exercise bike than a typical recumbent. It also presents fewer opportunities for long term gain than the machines above. Nevertheless, the exceptional health benefits of cycling do not go away when the gadgetry does and the Technovita YF93 will let you take a stimulating ride at a mild to moderate pace with better back support than a standard folding bike. It is essential to shop for home exercise equipment with your own needs and aims at the forefront of your mind. 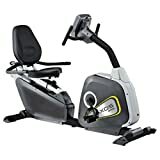 This Top 5 represents a wide range of recumbent exercise bikes out there on the market today and each holds unique appeal for a particular user demographic. That being said, our winner is a true all rounder. A recumbent bike with sufficiently impressive specs and design to tempt the super fit yet the well considered, tailored guidance a beginner needs to set them on the path to fitness. 32 workout apps (with the potential to add on more) and that realistic ride feel set this bike apart as a stimulating home exercise solution that will repay your investment with results. Recumbent bikes are becoming a popular and increasingly mainstream cycle choice for recreation and home exercise. The relaxed riding posture is ideally suited for users whose neck, back or shoulder weakness or injury restricts their range of movement. They allow that all important cardiovascular exercise without putting strain on vulnerable areas. The obvious differences between recumbent and traditional bikes is the seat position and that posture. Recumbent bike riders sit back and pedal with their feet before them. When it comes to stationary bikes, a recumbent, like the majority of cardiovascular exercise equipment, can offer a rewarding workout IF you put the effort in. If that relaxed posture inspires a leisurely pedal along to an engrossing episode of a brand new box set, you are unlikely to see dramatic results. If you commit to increasing the resistance and intensity of your regime and keep to a consistent and challenging pace, a recumbent bike will reward your efforts with better heart health, a toned lower body and significantly improved strength. Though you will be getting an aerobic workout, those lower body advantages are significant. The muscles engaged by the riding motion include calves, hamstrings, quads, glutes and last but not least your abs. Abdominal muscles stabilise the upper body to help maintain balance as you ride. And a strong core is key as you ratchet up the intensity of your recumbent rides to maximise calorie burn and see your body alter. You will also enjoy reading our reviews on magnetic exercise bikes.